Bit Blot‘s 2D side-scrolling adventure game Aquaria [$4.99] for the iPad is a gorgeous and well-produced title with a sharp emphasis on world-building and character growth. It’s good, and I think the reason why it strikes me as such a quality download has more to do with its atmospheric allure than anything else. Aquaria begs you to explore with every ounce of its being by consistently introducing mechanical novelties, alien setpieces, fascinating creatures, and drip-feeding a not-quite-but-totally convoluted story that keeps you thinking that you’re on the precipice of figuring out what’s going on with your mercreature in the game’s beautiful underwater world. It has a few minor problems, though. 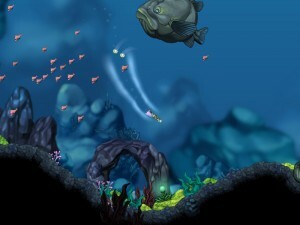 One of the bigger missteps in Aquaria is tied to the limitations of its new platform. Indie developer Bit Blot and its partners have masterfully replaced the cursor with finger, allowing for complete character movement without virtual pads. But the shooting and “singing" components? Those require virtual buttons and that sticks out. Also, when these actions are coupled with the need to evade, you may inadvertently start playing Finger Twister instead of Aquaria. For the most part, control isn’t a huge problem. Aquaria‘s world has its share of danger and the occasional boss fight, but as a whole it’s more of an ambient, leisurely experience that’s more centered on exploration of its lovingly crafted environments. It is somewhat telling where the priorities reside, actually, just by how routine (in contrast to the exploration) and clumsy the fighting parts tend to feel. The art in Aquaria, in particular, is captivating and subtle. Bit Blot doesn’t beat you over the head with concentrated “look at me" moves pointing out the ridiculous level detail and quality. On the other hand, the writing and music (as well-produced as it is) are pretty over-the-top, giving the overall experience an artsy-fartsy kind of tone. Song, by the way, is a big part of the experience. 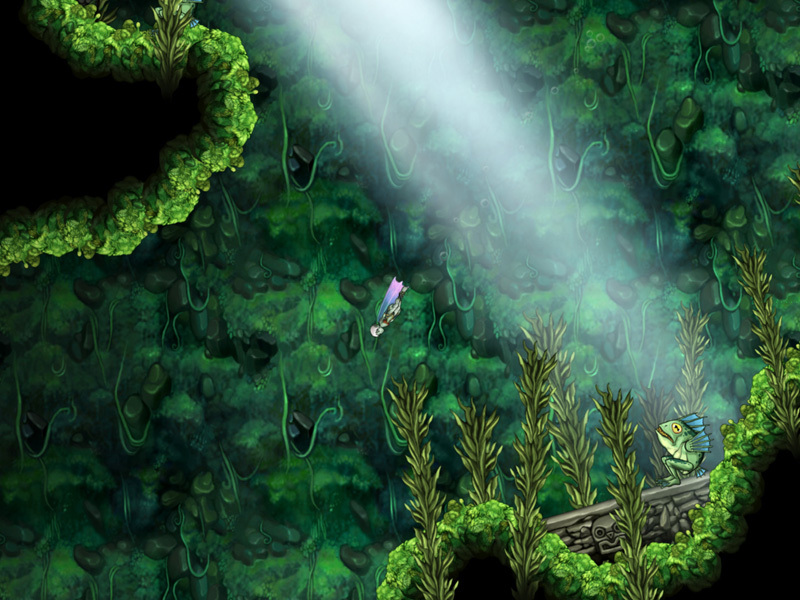 You play as a mercreature who, one day, begins a quest to uncover the past of this world. Your ‘weapon,’ initially, is music that can conjure various abilities, including shielding as well as the ability to lift heavy objects or turn your mercreature into a fire-slinging demon. You pick the notes to songs that summon these powers, kinda like how you played the ocarina in Ocarina of Time. The core difference is the visual representation of the notes, all of which seem to have a connection a specific element. Puzzles all subtly require a knowledge of what’s at your disposal and often challenge you to think about combinations or around what you have. Environments usually lay down a heaping of clues, which helps and doesn’t necessarily rob you of grand “a-ha!" moments. Let’s talk about the genre for a second because, in a strange twist, it’s one of the more frustrating and refreshing things about the entire experience for me. 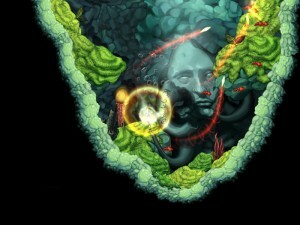 Aquaria is a Metroidvania set in a fantastic sea. The genre revolves around gating you, keeping you away from certain areas until you receive an item, song, or spell that can get you into it. Bit Blot adapts and adheres to these conventions particularly well, and its execution keeps the experience consistently fresh. It’s what pushes the narrative, makes the atmosphere pop and sets the table for all of Aquaria‘s experiences, creatures, novelties, puzzles, and exploration — you know, the stuff I was gushing about. In a cruel twist, this is why Aquaria can be frustrating. When you get stuck, everything slows to a crawl as you search, re-search, and search again for that one single missing thing to get you past the next gate. Also this gating, and your subsequent laser-rocket desire to move past these barriers, obscures some of the finer elements of the game. Like, the cooking system, which allows you to take bits of “loot" or food you recover from enemies or plants in the world and morph them into something that boosts the stats of your character. But at end of the day, Aquaria is overwhelmingly refreshing. It’s one of the handful of games on the App Store that you could call complex while not subsequently pointing out an elaborate and infinitely tweakable RPG sub-menu or sub-system that has a hand in all the on-screen action. Sure, it has a control problem and, yeah, maybe the gating can be nerve-racking at times, but when you’re clicking with the game there’s nothing quite like the experience Bit Blot is offering here. It’s so well-produced and offers such a beautiful and compelling world, that I easily forgive its shortcomings. You probably will, too.